The Electorate's military flags as well as the Royal, were found in a lot of various types. Too many, to show them all here. Some of the mainly used shall be enough for this little exploration of Hanover's history. In the 18th century already, small yellow&white banners were used as ornaments of Hanoverian uniforms and weapons of the Cavallery and Army. During the Napoleonic wars, mostly a kind of Unionjack was used, as Hanover fought on England's side as the Allied Army. 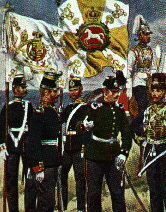 Such a flag was used with the King's German Legion (more information on http://www.kgl.de).